Say we appreciate you with this lovely Sweet Summer gift box! 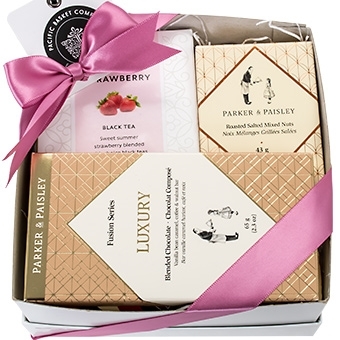 Our mini gift box contains a box of strawberry tea from Murchies, Melinda's cranberry almond biscotti, a Luxury chocolate bar and a box of mixed nuts by Parker and Paisley. Box size 6x6x3"